The team views the chatbot as guided discovery—the questions start big and then narrow down until the task is completed and the best recommendation can be given. In order to provide the best recommendation, the bot must understand what the traveler is really looking for—after all, a restaurant recommendation in Miami will be different based on if someone is traveling for work or pleasure. Chatbots have potential to be a powerful, personalized tool. Because they can remember things users say, it can get personal and hopefully soon learn soft signals and natural conversation. That way, even if a user doesn’t explicitly ask something, a chatbot could potentially know what to recommend based on their patterns or behavior. However, getting smarter over time is a unique challenge in travel, as people’s travel preferences can change greatly depending on the purpose of their travel, which means the bot needs to be adaptable to different travel needs. TripAdvisor also learned that building a chatbot isn’t a one and done process—there is always room for continued growth and improvement. The company’s next focus is to increase engagement with its partner businesses to provide better recommendations to customers. 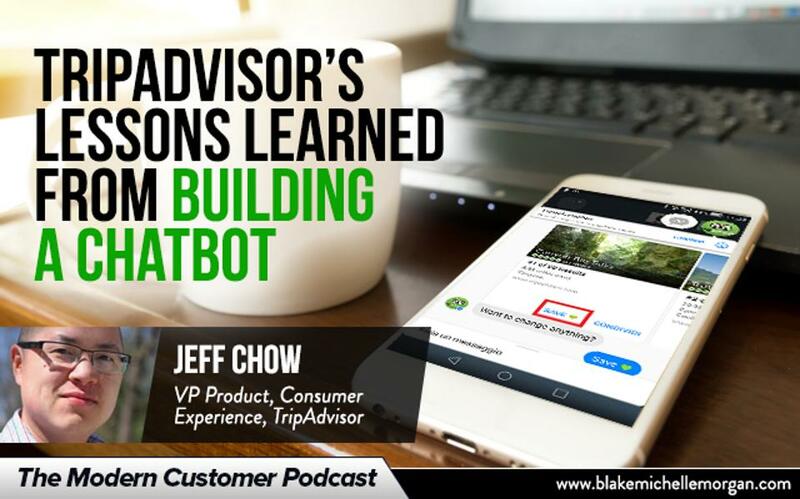 Jeff’s best advice from the TripAdvisor experience is for other companies to be strategic with their chatbots and technology. Don’t create a chatbot just for the sake of doing it, but instead think of what it can do to move your business forward. When done correctly, chatbots can create great opportunities for an organization.